Box8 Any Meal @ Rs.99 Offer || Box8 is back here with a Great offer for its new offers. Buy a meal worth Rs 298 at Rs 99 only. Grab it Now..!! How to Get Meal @ worth Rs 298 at Rs 99 only? 3. 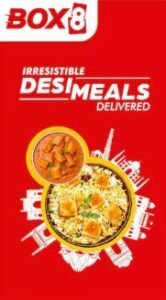 Valid on All-in-1 Meal, Fusion Box, Sandwich, Wraps, Salads, Biryanis & Curries. 7. The company reserves the right to alter or reject any coupon code presented against a purchase, if they deem, at their sole discretion that the coupon code has been forged, defaced, manipulated or otherwise tampered with.